This is one of the most hard to find egg scales. It is a Salter based on the spring letter scale. It is graduated in ounces and goes up from 0 to 8 ounce. Last official marked calibration in 1946. Super nice cleaned condition. 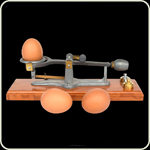 This is a more common American made egg scale but seldom found complete. This is a complete one including the graduate weights. 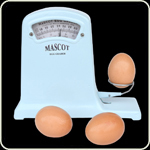 It is a so called Magic Egg scale made by National Poultry Equipment Company in Seattle Washington. 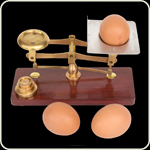 The egg grading scales is in a perfect condition. Samuel Turner, Senior made this nice English letter/egg scales which also has an oval indention for weighing eggs. It sits on a legged wood base that is about 7″ x 2,9 “. 3 weights are fitted on the base. The Egg grading scale was sold by C. Wilcock & Sn. Chorley UK. Perfect, cleaned condition. This is one of the most beautiful Egg Scales ever made. It is a Mascot made from pot metal and because of its design called “Parking Meter”. 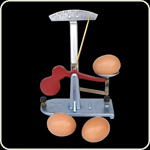 The egg scale / grader made by Prospectus Mfg. Co. 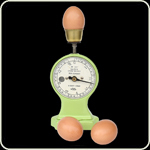 The egg scale weighs from 16 to 32 ounces per dozen. Perfect condition. This is an American made Zenith Pedigree Egg scale / grader made by O.W. Bedell Earville New York. The Egg grading scale is graduated in oz. It weighs from 18 up to 30 ounces per dozen. You are currently browsing the HuubGeurts.com blog archives for July, 2009.